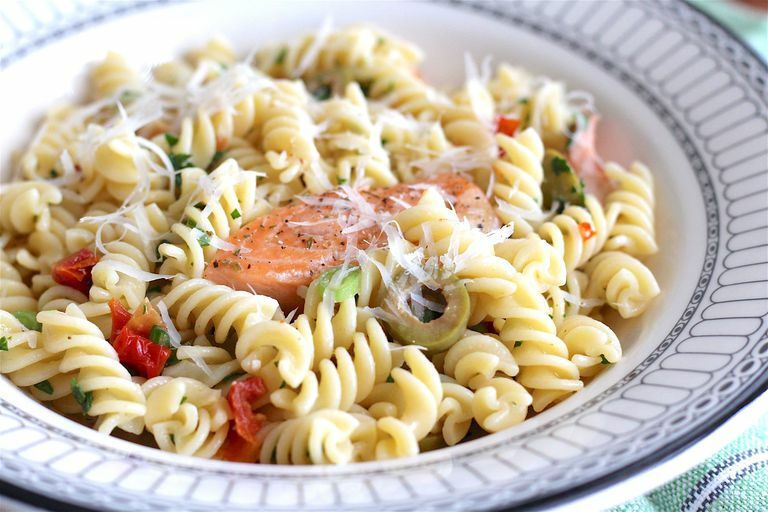 This versatile pasta salad, with its mouthwatering bits of baked fish, olives, and sun-dried tomatoes, makes a terrific family dinner or lunchbox meal. Because it is equally delicious warm or cold, it also makes a good dish to share at a potluck supper or buffet. Most gluten-free pastas are low-FODMAP, but steer clear of those made with beans or lentils. Preheat the oven to 425F. Spray a 9 x 9-inch baking dish with oil. Place the raw salmon fillet skin side down in the prepared baking dish. Spray or brush it lightly with some of the olive oil, and sprinkle it with herbs de Provence. Bake for about 20 minutes, until the fish can be easily flaked with a fork and is opaque in the middle. Cool for about 10 minutes. Meanwhile, prepare the rotini according to the package instructions. Drain it in a colander, and rinse it briefly with cold water. In a large salad bowl, stir together the remaining olive oil, capers, scallion greens, fresh parsley, olives, sun-dried tomatoes, lemon juice, salt, Parmesan cheese, and pepper flakes if using. Add the rotini and toss thoroughly. Use two forks to flake the salmon apart into small bite-sized pieces. Add it to the salad bowl and stir gently. Garnish with additional parsley and Parmesan cheese if desired. Roasted, pulled, or chopped chicken can be substituted for salmon. Other herbs, such as fresh basil, can be used instead of parsley. Gluten-free pastas made from combinations of gluten-free grains (such as quinoa and corn, or corn and rice) tend to be the best substitutes for regular pasta. For best results, don't over-cook it. Rinsing the pasta after draining will stop the cooking and removes starches that might otherwise make the pasta stick together. If sundried tomatoes are not soft enough to chop easily, soak them in about ½ cup of boiling water until pliable, about 10 minutes. Drain, then chop.